The free anti-virus and anti-spyware solution from Microsoft for Windows operating system, Microsoft Security Essentials (MSE), provides basic but important protection and shield against malicious and potentially unwanted programs. Since the final RTM version of Microsoft Security Essentials been released at s build 1.0.1611.0, Microsoft has continuously updated the security software offering. For example, as discussed in the My Digital Life forum, MSE build version 1.0.1676.0, 1.0.1743.0, 1.0.1801.0, 1.0.1901.0 and 1.0.1959.0 had been released as upgrade version of Microsoft Security Essentials. 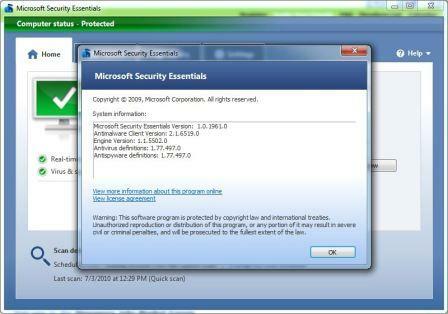 The latest version of Microsoft Security Essentials as of end of February 2010 is MSE version 1.0.1961.0. Windows Update, Microsoft Update nor Automatic Updates will automatically upgrade the earlier or older version of Microsoft Security Essentials application program. Although it’s possible to manually upgrade Microsoft Security Essentials via Help -> Upgrade Microsoft Security Essentials menu command, some users may want to download standalone setup installer for MSE which can be used for offline installation. Fortunately, Microsoft places all updated version of Microsoft Security Essentials at the same download page on MSE official website at www.microsoft.com/Security_Essentials/ and Microsoft Download Center, with the same direct download links for each and every versions. Microsoft Security Essentials is free not only for personal and home users, but also free for small businesses.